Your poems may be considered previously published work. Literary journals aren’t as likely to publish work that has been published elsewhere. Consider self-publishing a collection featuring your poems that have already been published in literary journals (with proper attributions to the literary magazines). You can increase the number of accepted poems you have with a strong submission strategy. You shouldn’t go it alone! The self-publishing process can be complicated and frustrating. Once you’ve made the decision to self-publish, you don’t want to get bogged down trying to decipher the technicalities of formatting, cover art design, or file conversions. The best way to navigate the unfamiliar territory of self-publishing is to hire professionals like Self-Publishing Relief to expertly guide you through each step. Most poets self-publish their poems as a chapbook—a smaller book, normally around 25 to 60 pages, well-suited for smaller print runs and more affordable to produce. You can also self-publish your collection as an e-book. An added bonus to self-publishing an e-book: If you need to make changes later on, it’s easy to edit the collection. Your online author platform should be up and running. 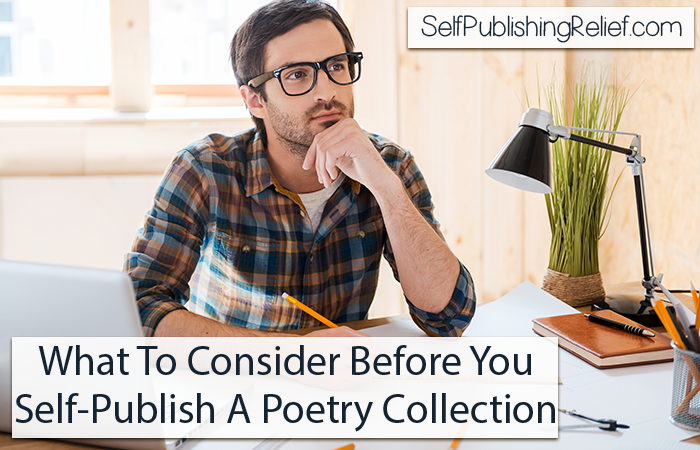 There’s a lot of work involved in getting your collection distributed, and you’ll need to devote time and effort into developing a solid marketing strategy—before your poetry collection is published and available. Your author website and social media accounts (especially Facebook and Twitter) should be active and already building your fan base. Prepare now so you’ll be ready to give away copies as gifts, to list your book on Amazon or Barnes & Noble, and to sell it at local coffee or gift shops. You can also start making arrangements for book signings and readings. Start with your very best poems. Many readers will base their buying decision on the first page or two, so make it count. Organize your poems by theme (nature, love, personal growth) or mood (optimistic, despairing, joyful). Or put them in an order that tells a story from beginning to end. Leave out poems that don’t fit with the overall theme. You may be in love with them, but they can always be part of a new collection! If your poems are highly visual or targeted toward children, consider allowing the font and/or layout of a poem to form an image. Be careful though. You want to engage the reader visually, but don’t make it frustrating to read. Make sure your book’s cover art reflects the overall feel of your poetry. Click here for more tips on cover design. Proofread, proofread, proofread (or let us do it for you! )—don’t let embarrassing mistakes hurt your book. QUESTION: Have you self-published a collection of poems? After offering several poems to various contests and publications, I finally self-printed a book in 2009. It went over well with my writer’s club, but outside them and friends/family, I’ve made exactly one sale (at an art show, after hearing me read one of them). I’ve since put it on CreateSpace and Kindle (August 2014), the first time I offered it free on Kindle I had about nine downloads. I haven’t had a paid sale (Kindle or hardcopy) since, or even matched my initial download free count. My work has been published in excerpts….does that count? Thanks very much for these useful considerations on self-publishing. Well, on the last week of December 2015, we have seen come live our second collection of poems written in the English language. It has been a work in co-authorship. This was a good read. I didn’t realize that a collection needed to be themed per se. The word collection led me to believe that it was simply a group of my poems. Ronnie, these are great tips. I have many poems, so the tips will come in handy when I decide to publish them.